The path to fearless investing requires the abolition of failed industry semantics. There’s a fine line between marketing gimmicks and meaningful naming conventions. Oftentimes a quantitative process can help separate the wheat from the chaff when it comes to these investment naming conventions. One concerning trend is the marketing focus and corresponding asset growth in “target date funds.” Target date funds aim to match an investors age or time horizon with a portfolio. There is consensus on the naming convention of such funds (e.g. Brand X 2030 Fund, Brand Y 2030 fund, etc.). But that’s where the similarities between target date funds stop and the need for a more quantitative view arises. Don’t get me wrong, some target date funds have redeeming qualities like low expenses, simplicity of gaining exposure to a diversified number of investments within a single investment, etc. But these are just small parts of what makes a great investment. Our data repeatedly confirms that determining an investor’s risk preference based on the stereotypes of age and time horizon is often wrong. In fact, an independent team of academics reviewed our risk questionnaire data and determined that many investors bucked their stereotypes. For example, 52% of 20-29-year-olds aren’t “aggressive” and 53% of 70-79-year-olds aren’t “conservative.” Choosing a target date fund based on the same stereotypes is a recipe for bad decisions. Investors that are inappropriately invested have a higher propensity to react emotionally when, not if, the markets turn negative. Without quantifying an investor's risk preference accurately, an advisor and investor are at risk of failure. Don’t let the numbers in the target date funds fool you, if you’re using old-fashioned semantics of age and time horizon to choose a target date fund, you’re doing it wrong. The investment composition of similarly named target date funds varies, sometimes drastically, between asset managers. The allocations between stocks, bonds, cash, and alternatives vary even between target date funds. In addition, the strategy or process of how the target date funds reduce risk over time depends on the target date fund provider. Blindly using target date funds ignores the differences in risk/reward composition. A quantitative analysis should be used to align each investor’s risk preferences with the proper investments, including target date funds. To highlight my point, check out the difference in Risk Numbers between four highly-respectable target date fund providers listed below. Going by date alone exposes investors to a wide array of downside. If an investor's risk tolerance isn't properly quantified, the chances of them staying with the investment strategy goes down exponentially. Putting assets in a fund and saying "trust me" is part of the reason why investing feels broken for many investors in the first place. Are all of these good funds? Sure. But when we don't take into account risk, target date funds are just the same old semantics wrapped in fancy packaging. Of course we want clients to invest for the long term. The problem is that investors react to risk in the short term. Quantifying a client's unique risk tolerance and accepting that the short term matters is the way we can get them invested in a strategy that works. 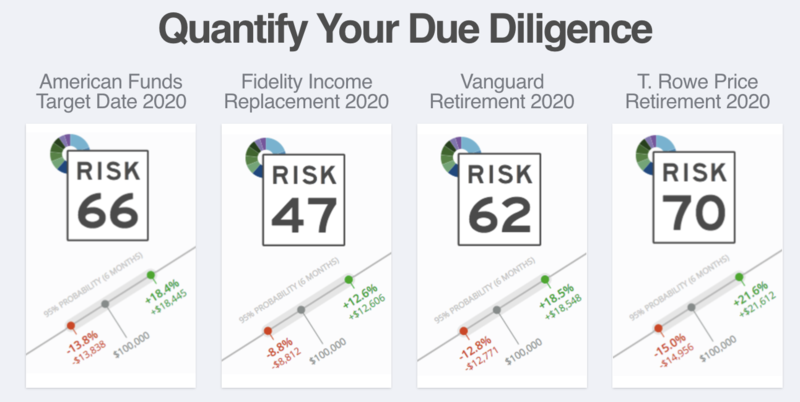 With Riskalyze, we can find an investor's Risk Number and then match them to a portfolio that aligns with their goals and risk tolerance. Just like all target date funds differ, so too do investors. A retirement date isn't math and it's not a cohesive investment strategy. Do you know what is? Quantifying risk tolerance and investing in the right funds that factor in the right amount of risk/reward. Throwing assets into a target date fund isn't fearless investing. The proper quantitative process to determine the risk preferences and risk composition of the available investments can help advisors ensure client alignment with the correct investment vehicles. Mike McDaniel is a practicing investment advisor, and is Riskalyze’s co-founder and Chief Investment Officer.